Write down the questions you have for the visit. Use the back of this brochure to list your questions. A medical test you need. 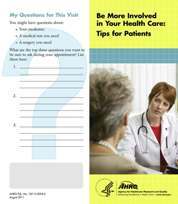 *The term "doctor" is used in this booklet to refer to the person who helps you manage your health care.